Foster and kinship carers are important members of any community, especially when they live in regional or remote areas. Nhulunbuy carers were acknowledged and celebrated at a special gathering on 4 March as part of the 2015 Foster and Kinship Carer Service and Excellence Awards. 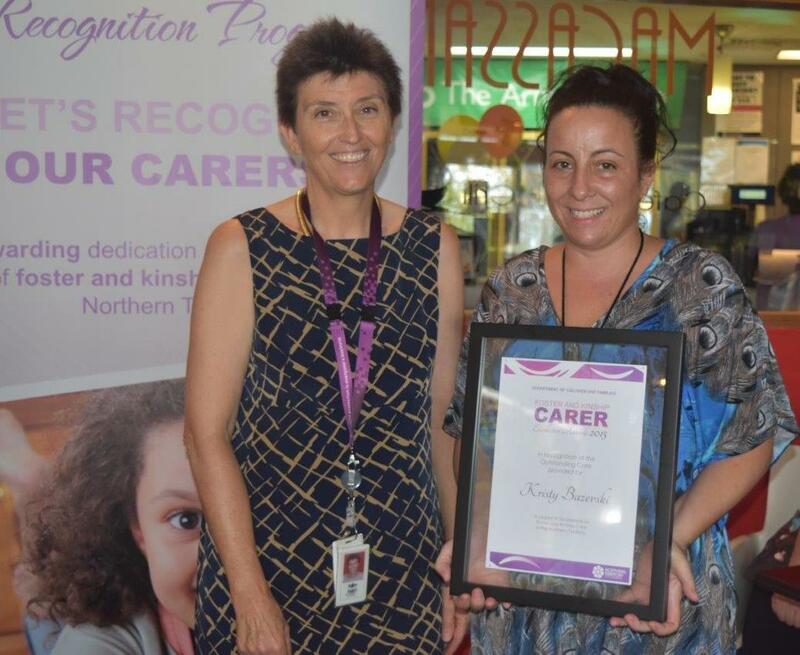 Recipient of the 2015 Foster and Kinship Carer Excellence Award for Nhulunbuy was Kristy Bazevski who has been a dedicated foster carer for over four years. Kristy's nomination included testimony that she and her family clearly gain many benefits from being carers and they personally thrive on creating a safe, happy and nurturing home environment. Other award recipients include Tilly Todhunter and Rhean Bates who received their Five Year Service Award. Department of Children and Families Chief Executive Officer, Anne Bradford, thanked all the carers for their valuable work and the contribution they make to the local community. To find out more about how to apply to become a carer go to the Carer Community website. Department of Children and Families Chief Executive Officer, Anne Bradford, with award recipient, Kristy Bazevski.